Sony BDP-S560 review | What Hi-Fi? Sony's BDP-S560 fills an improbably narrow niche in its range, between the BDP-S360, a player we've declared the finest budget deck on the market, and the formidable BDP-S760, Product of the Year in the 2009 What Hi-Fi? Sound and Vision Awards. 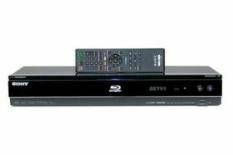 Essentially, the BDP-S560 is a media-friendly upgrade over the entry-level 'S360. The Sony includes a front-mounted USB input for easy display of your digital camera pictures, plus built-in wireless network connectivity for easy access to BD-Live features. There's no internal memory though, so you'll need to use the second, rear-mounted USB input to add in a suitable memory stick. Still, at least the socket has been thoughtfully recessed into the body of the player to avoid protrusions into your kit rack. On the other hand, thanks to DLNA support, you can also use the Sony's wireless capability to link it to other devices on your network, such as your PC, to share your digital photos: useful, if not quite as all-embracing as the LG's DLNA provision. And while we're griping, there's no 7.1-channel analogue output, either, whatever Sony's website claims to the contrary. In picture quality terms, the BDP-S560 is identical to its little brother, which is no bad thing. Its image boasts the same exceptionally crisp, detail-driven approach as its sibling, so every last grain of Super 16mm grain on the image in Kathryn Bigelow's The Hurt Locker is displayed in pristine fashion. Close-ups are remarkable too, with fine details popping out of the screen, while motion is assured and DVD upscaling first-rate. However, the newer LG BD390 and Philips BDP7500 decks boast more colour richness, better black depth and, to our eyes, a more appealingly smooth, filmic image. While sound is good, our previously noted reservations about the 'S560's tonal balance still pertain. Relative to the cheaper BDP-S360, it's both louder and a little brighter to listen to. And, in comparison with the best rivals, that leaves it a little outgunned. You won't want for detail in the mix, and dialogue is crisply distinct even in the densest action, but higher frequencies can sometimes jar, and both the LG and Philips can muster significantly more weight with Transformers 2's formidable firefight sequence. The BDP-S560 remains a fine player, but it drops a star. Given the discounts on the similar BDP-S360, it no longer offers such good value for money – and the newer LG and Philips decks are even more complete. Such is life at the top.